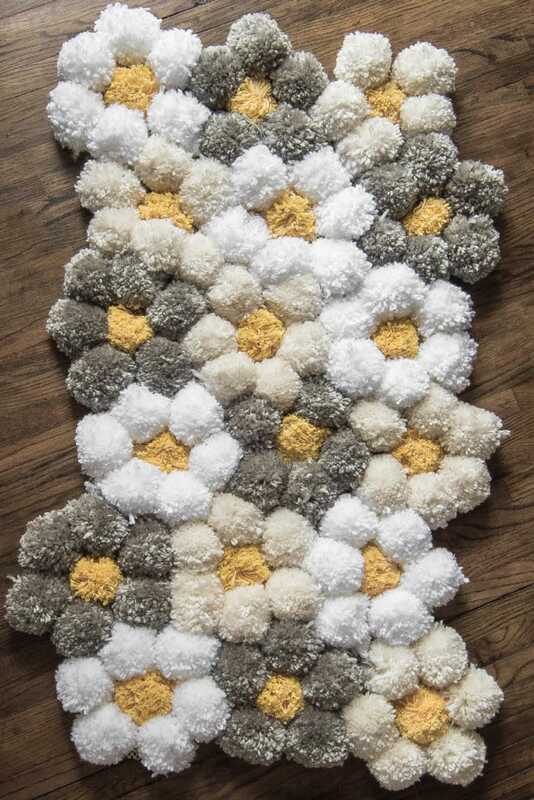 I haven’t posted in a while because I have been working on this pom pom rug, for what feels like, forever. I tend to do things the hard way first and this rug was no exception. But then I figured out how to crack out pom poms almost four times faster than I was making them before and the project suddenly didn’t feel so daunting. The trick is in how you wind the yarn around the maker; and I feel like an idiot for not figuring it out sooner. ~This post may contain affiliate links. If you click one and make a purchase, I may receive a commission at no additional cost to you. I chose to design my rug with a flower pattern. In order to make that pattern visible I had to use 3 different colour yarns, and a yellow yarn for the centers. Any colours would work well with this rug mat, just keep in mind if you use a singular colour, your rug will look more like polka-dots vs flowers. You need to have a few different colour yarns to create borders and contrasts. I also chose to use cotton yarn for the center, it adds a bit of contrast to the yarn I chose for the rest of the mat. The cotton pom poms actually look like flower centers. For my 24″ x 42″ sized rug I used 15 skeins of yarn. 5×7 is what I used, but really a 4×6 would have been more than adequate. I could not find a 4×6 with the right size honeycomb, but I am sure they do exist. This is a set of 2 large pom pom makers, I used the 2.5 inch size for this project. You do not have to use a pom pom maker, although I will say it will save you a considerable amount of time. 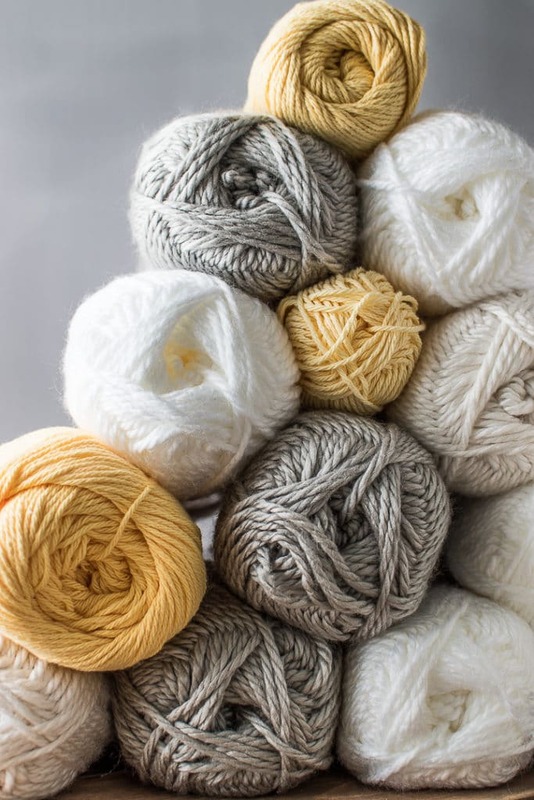 So what’s the right yarn to use? Well, it depends on the look you want, and how patient a person you are. Thin yarn will extend your DIY pom pom making time considerably, and thick yarn might not be the right look. I created a pom pom yarn comparison post that shows how five different size yarns look when made with four different size pom pom makers. I even tested different types of yarn to see what kind of look I would get at each size. 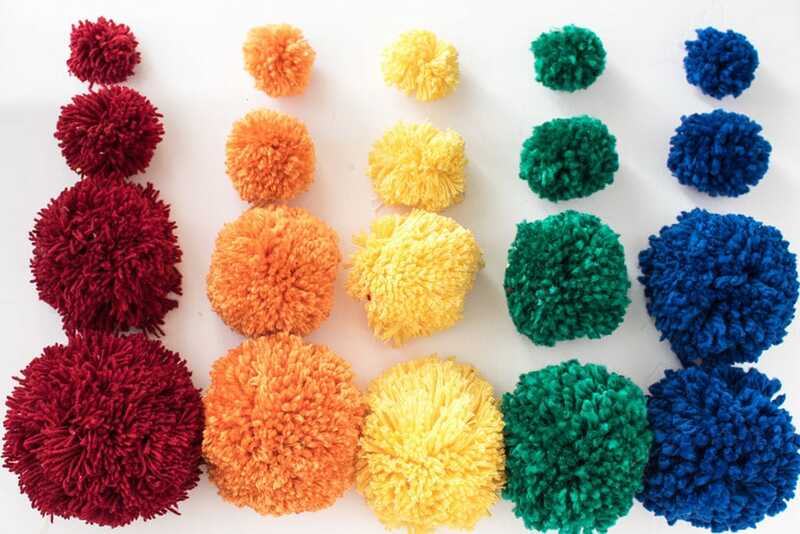 Check it out, it might help you decide what size and type of yarn you will want to use for your DIY pom pom rug. I chose the middle ground, a bulky thickness yarn (size 5) that would give me a nice fluffy look, and help me make my pom poms a bit faster. Just how many pom poms do we need to make for this project? So this project required 15 skeins of yarn (yeah I know.. right? ), and about 125 pom poms. I wanted a rug that would fit under my desk to keep my feet warm in the winter, so my rug is a bit on the small side. I also choose to make my pom poms with one of the large clover pom pom makers. It’s not the largest, but it is biggish. 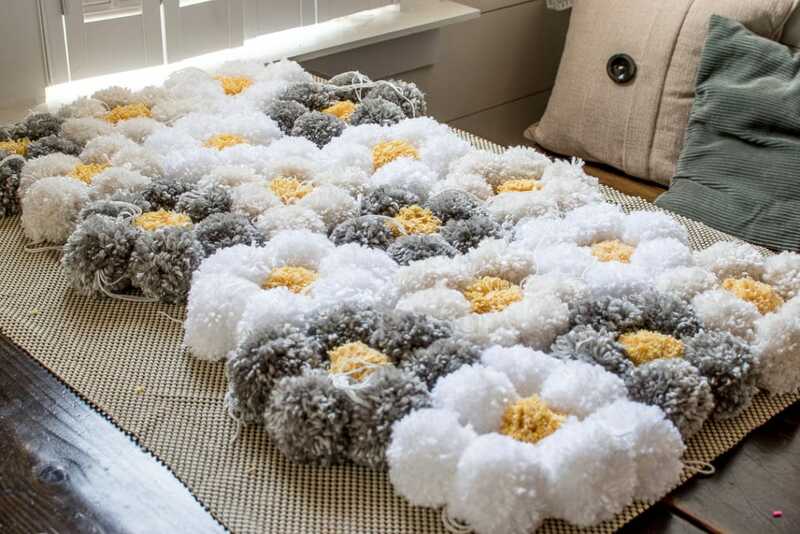 Each pom pom is around 2.5 inches and I felt that was the right size for this rug. Also, note that each skein of (this) yarn makes approximately 9 pom poms with a 2.5 inch pom pom maker. And if you want to know how to make pom poms with a clover maker tool I have a detailed pom pom making tutorial in my Valentine’s day heart wreath post. Important TIP: When you make your pom poms, make sure you cut a nice long piece of string and double it up to wrap around the center. When you are trimming your pom poms, leave the string tail nice and long. The tails will attach our pom pom to the rug backing. Doubling up your string will reinforce your pom poms and keep them from falling apart. So what’s the trick to making super fast pom poms? These pom pom makers do not require a lot of fiddling with tape or making replacement templates. They are sturdy, last a long time, and do the job quickly. Since they are an inexpensive crafting tool I highly recommend purchasing one if you are attempting a larger project that requires a lot of pom pom making. Second, if you have multiple skeins of the same colour yarn, wind multiple strands of yarn at the same time. I used 4 strands at the same time and I could make a pom pom from start to finish in two and a half minutes. Considerably faster than winding a single strand around and around my pom maker. And the last tip is to make sure your scissors are nice and sharp. You may find that as you are trimming your pom poms your scissors start to stick. Use a small soft cloth and wipe your scissor blades every few pom poms and they will be good as new. Tip #1 – Use a pom pom maker, they speed up the process considerably. Tip #2 – Wind more than one strand of yarn at the same time, this really speeds things up. Tip #3 – Use a very sharp pair of scissors to trim your pom poms. Oh, I bounced around on this one, but at the end of the day, the honeycomb style rug backing was the best. Not only did it provide spots to attach the pom poms, but it also provided padding and a non-slip backing. Since the yarn is so soft it will be slippery on the floor, using a non-slip backing makes sense. If you wanted to reinforce your rug even further, you could add a second layer of rug backing. If you choose to do this I would suggest simply hand sewing the second backing to the first in X patterns all over the back. 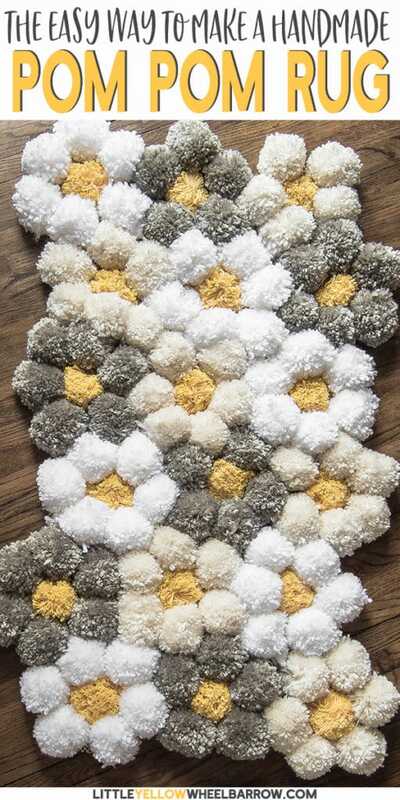 Adding the second layer will also give your DIY pom pom rug a bit more longevity. Once you have all your pom poms made and trimmed it’s time to figure out your design. The easiest way to do this is to lay out your rug backing on a table and start placing your pom poms in flower shapes in the design or style you want. I spent a good amount of time just fiddling until I got my rug laid out perfectly. 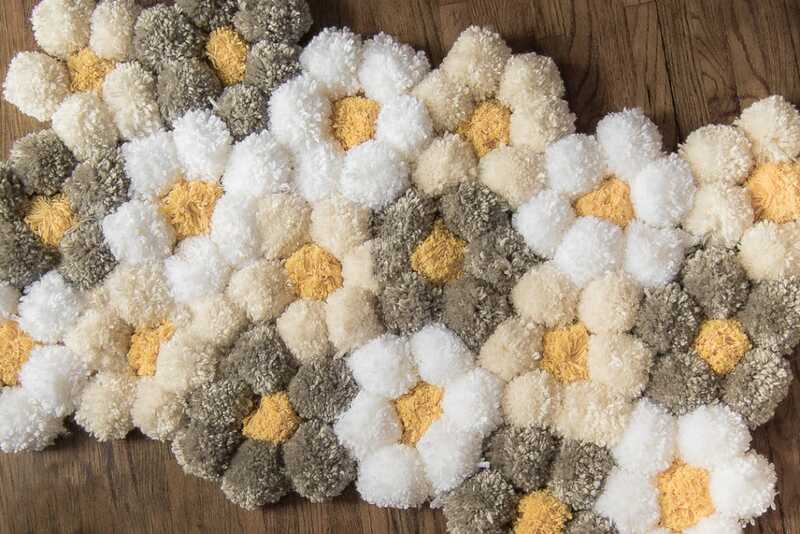 There is no pattern to this daisy pom pom rug, I seriously just spread my flower colours around the best I could. To attach the pom poms to the rug backing simply use your long string tails and thread them through the holes in your rug backing and tie them off. I would tie them twice to make sure they don’t detach. 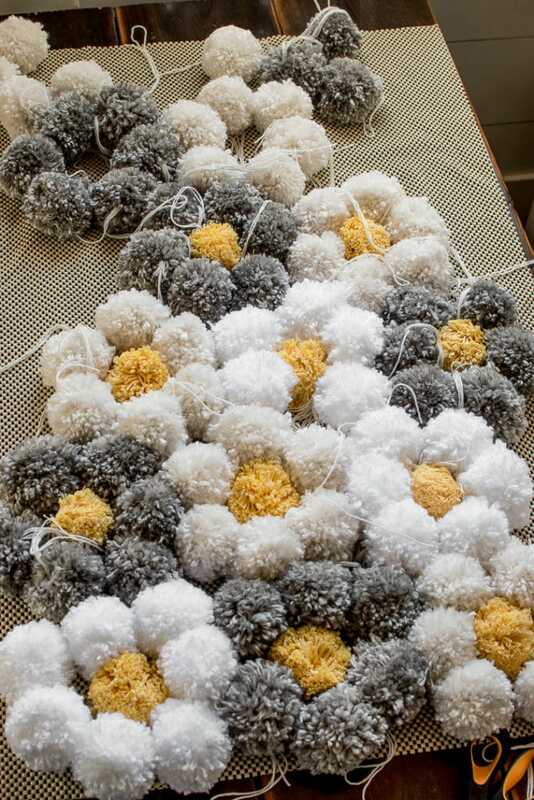 Once all your pom poms are attached, flip your rug over and trim off the excess backing. Make sure you use acrylic yarn to make your DIY pom pom rug or at least something that is 100% washable. When you are making the pom-poms, you really need to make sure to wrap your tie string around at least twice and really ratchet down and tighten as much as you can. This will ensure that your pom pom does not come apart in the wash.
Make sure you tie your pom poms on to your rug backing very, very well. You don’t have to tighten them super tight, but it would be helpful to tie them each down at least twice. When you wash your rug make sure you put it in a protective covering first. I used a king size pillowcase but you could use a lingerie bag or even a duvet cover. Whatever you use, make sure the rug has very little room to move around. I locked mine down by tieing a rope around the top. Lay your rug flat to dry like you would a sweater. The longevity of your pom pom rug rests in your hands. If you take the extra steps while making your rug, it will last a long time. Be sure to double your up your tie strings, and double tie down your pom poms to your rug backing. Pom pom rugs are super fluffy, and very warm under the feet. The centers of each pom pom are pretty hard. The fluffier you make your pom poms and the tighter you tie them off, the harder they get. The outside of the pom pom is soft and fluffy but the inside is hard as a small marble. This makes them a tiny bit uncomfortable to walk on. You can remedy this by making your pom poms less fluffy, but your rug will not look nearly as good. The rug is ok to sit on, and or lay on. I do not find that the hardness of the pom pom centers bugs me in those situations. But I definitely do not like walking on mine. My rug was intended to keep my feet warm under my desk and that’s the perfect use for it. It’s a rug to keep your tootsies warm on a cold day, not at all for walking on. On a different note, my labrador Daisy has already tried to claim this rug as her own. She very much enjoyed rolling around on it attempting to detach the pom poms from the rug backing. That dog is 80 pounds of fun. I kinda feel like I have to make another one because she is so smitten with this one. GAH more pom poms! 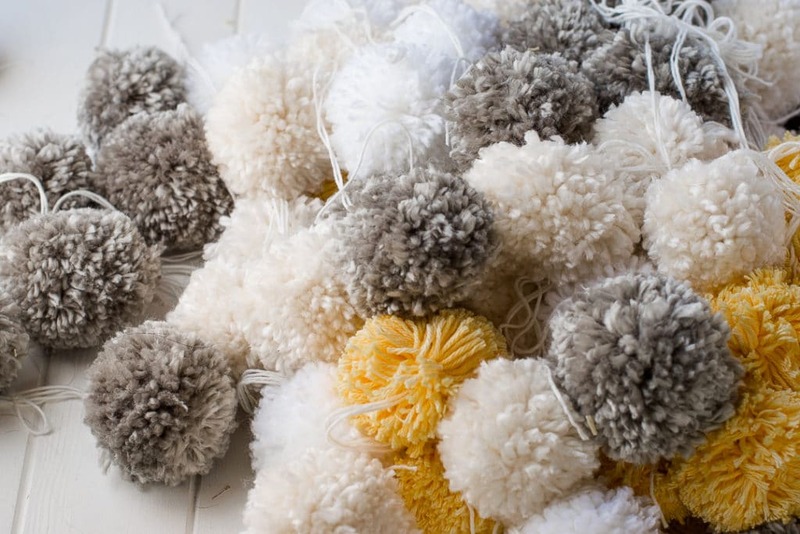 « Yarn Pom Poms – How to Pick the Right Size Yarn for Your Pom Pom Projects. This is info I was looking for and Daisy is the peace de resistance. I love puppies a lot lol. You’re very welcome April, and thanks so much for the comment. The rug was a lot of fun to design so I am glad someone liked it! Cheers.